Royal by D'Addario reeds are filed and feature a thinner profile and blank. They are ideal for students and advancing players, and are revered by educators worldwide. 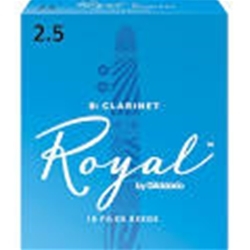 Royal reeds offer ease of response and increased clarity in the sound. D’Addario’s state-ofthe-art machinery and reedmaking process have resulted in unprecedented consistency in today’s Royal reed.